Well here we go kids, the January we’ve been waiting for! Time to cuddle-up and tuck-in to some Roasted Tomato Soup. Doesn’t the sound of it just warm your insides? I know you are saying tomatoes are junk this time of year, and typically yes, that’s true. But this soup uses a combo of roasted grape (or cherry) tomatoes and good quality canned tomatoes. How lucky are we (that is if you like in Minnesota) to have Bushel Boy tomatoes available year round. I always pick up a few pints of when I’m at the store, they are perfect for this soup. Grown right in Owatonna, I love how they say the ship across counties, not across the country. healthy as all get out! The fresh basil is a wonderful splurge this time of year. One tip for keeping it fresh for a few days is to leave it on the counter, it really doesn’t like to be in the fridge. Try to use it in a few days of purchase. Just add a delicious grilled cheese sandwich and you have the perfect meal to keep you warm on one of these frigid nights coming up! On a rimmed baking sheet, add the tomatoes and garlic and toss with olive oil, salt, and pepper to taste. Roast for about 30 minutes at 400º or until nicely charred. 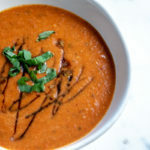 Combine the roasted tomatoes and garlic, shallots, canned tomatoes, stock, basil and rind in a large soup pan. Bring to simmer for about 30 minutes, stirring occasionally (don’t let it scorch). Let cool for about 10-15 minutes (we wouldn’t want to burn ourselves, would we?) Remove parmesan rind, then using a stick blender (a blender, in batches) puree until smooth. Again taste for seasoning and salt and pepper to taste. Option: add a swirl of cream to bowl right before serving. Also delicious with some grated parmesan cheese. 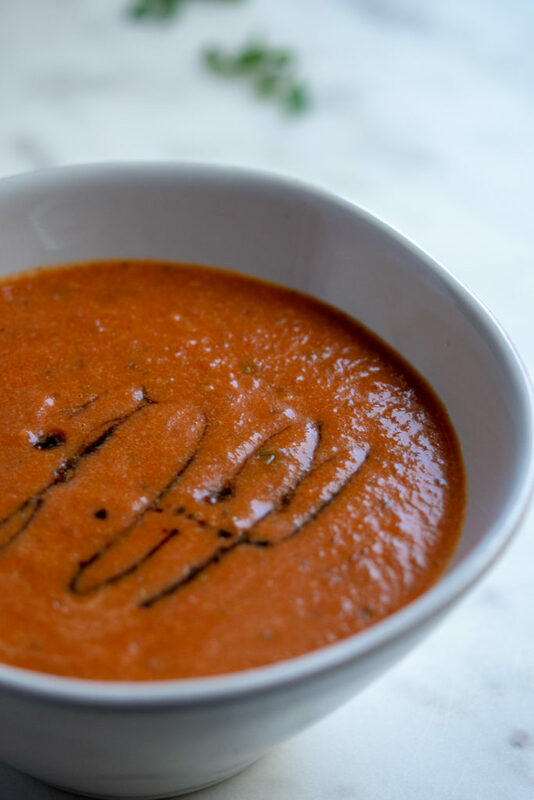 • This is an old Italian trick you should use for any tomato style soup or stew. The rind of the parmesan adds an enormous amount of flavor (also called umami). It really takes this soup over the top! 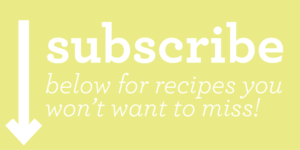 **a great trick to add extra flavor to soups and sauces. I always save the rind in the freezer to use for this purpose. Add a little drizzle of balsamic vinegar (see below) if you’d like. It adds a wonderful sweetness that complements the parmesan cheese. Enjoy. And stay warm this week!